Countries like Pakistan have a unique privilege from the historian’s point of view. Unlike most traditional nations, their colonial legacy gives them the benefit of having an exact moment in history where they can mark their arrival in the world as a distinct, individual nation. For Pakistan, the experience of partition and the carving out of one country from another makes this an even greater reality. That the events of 1947 took place only 70 years ago means that we still have, and will continue to have for some decades at least, people who have witnessed the country’s history from the day it was born, so to speak. But even as Pakistan’s first centenary approaches, we will soon realise that these upholders of the truth are no longer among us for long. We are currently living with perhaps the last few of the generation that had reached adulthood at the time of partition. Quite soon we will also lose those that were adults during 1971 and great stores of knowledge and experience will have been lost to the Pakistani historian. In such times, close attention must be paid to the memoir. Understandably enough there is great commotion when the memoir of a politician, sportsman or some other form of celebrity is released. Memoir from these people are official statements, that almost always offer comments on the issues of the day, which further explains why many of these people often publish more than one memoir. But then there are memoirs from people less prominent but no less significant. Consequential lives that will not be featuring in any history books, but which have played crucial roles in shaping the world into what it is today. Their experiences offer lessons and a distinct look into the mechanics of things in life both big and small. 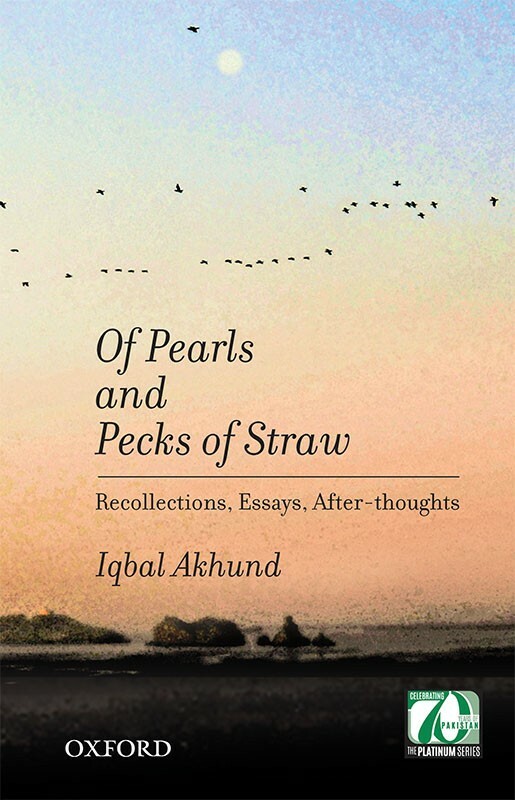 One such man who has lived a noteworthy life of some consequence is Iqbal Akhund, who has now published his second memoir titled “Of Pearls and Pecks of Straw.” And after 35 years in the foreign service, one would be rather surprised if there had been no notable moments of lasting significance in his lifetime to write about. This wistful, good natured, almost apologetic explanation, perhaps for the benefit of the reviewer rather than the general reader, is reflective of the entire work. The personal history that encompasses trying times for a nation and questions greater than those limited to a single life are written almost obliquely. The full title of the book is “Of Pearls and Pecks of Straw – Recollections, Essays, After-thoughts.” And that is exactly what the book is. A collection of memories and latter day wonderings, all written in the wistful solemness of a retired diplomat who has seen the world and navigated all of its narrow crevices. The reason why a number of memoirs end up failing to hit the mark is that they fail to talk about greater issues. Even figures of some importance often find themselves in similar situations. While there may be much interest surrounding their personal life, the books often tend to fall through is too simplistic and value laden. What Akhund has done in this volume is to quite casually connect the his own personal memories with the greater story of Pakistan. Whatever one may say about a former ambassador writing two memoirs, no one can say that Akhund does not have anything to say – and what he does say is all of certifiable value. And how could it not be? Put the man in his context, he is part of the pioneer generation of Pakistanis to join the foreign service, he has had stints as Ambassador in Cairo, Belgrade, and Paris as well as being the Permanent Representative to the United Nations in New York, presiding over the 1976 Security Council. He would go on to build quite a portfolio in the UN, becoming the Chairman of the UN Economic and Social Council as well as the Chairman of the developing countries group of 1977 before ending up as the Secretary General’s special representative in Lebanon at a time when the eventual tensions between the Lebanon, Syria and the PLO were wrecking havoc in the region. He would then also go on to serve as Benazir Bhutto’s first government advisor on National Security and Foreign Affairs. In between these pages are the experiences of an extraordinary life. Perhaps not one extraordinary enough to warrant biopics, but it presents the narrative of a man who has seen much on important issues such as religion, partition, and westernization – all banes of our existence and questions that continue to plague us. On these he offers useful commentary without any of the pretense or high browed disdain that one might expect from a columnist or a commentator. The book is of course a very personal affair. One can see that simply through the glossy pages it is printed upon. It has been published to be gifted, and not in hopes of high circulation. It is perhaps a final letter from a servant to his country, and it is a beautiful example of what it is.